I'm so lucky to have this view every morning! So I'm wondering a few things about my audience... what would you like to hear more about... Things going on in the neighborhood? Running related news? My own running adventures? Places to visit in the neighborhood (restaurants, etc). Just something silly I did this weekend.... everyone else was doing it :) A cloud of my most frequently tweeted words for the last 3 months. The only reason Pisces is so big is because of the once inescapable twittascope. I held off on this for a while, mostly because right after I got it we went away on our honeymoon and I didn't have time to post about it, but now that it's time for the "shopping season" I think the timing is right. My hubby and I went all out on wedding presents for each other, but not in the traditional sense. I think people usually give each other fancy watches and necklaces or other flashy jewlery... but I got a different type of jewelry- a Garmin Forerunner 405. If you don't know what it is, its a GPS running watch that tracks your speed,elevation and distance while running (or biking or walking or whatever forward moving activity you do). Let me start with my initial reaction after using it the first time- This thing is AWESOME! :) It really is pretty amazing. You put it on, go outside and within a minute or so you're linked to the satellites above and it lets you know how fast you're going, how far you've gone and of course how long you've been running. Thats really lots of fun, but it gets even cooler when you get home! It wirelessly connects to my computer when I bring it within a metre and sends all of its nifty info right to the computer! It then uploads all of that info to my Garmin connect site so I don't have to write it into my running log book. It tracks calories, elevation gained and lost (which is quite amazing in this neighborhood!) and your pace at any given moment during the run. Whew. I thought it would be overwhelming, but its really improved my training. It was great to have during a recent race I did in Central Park where I wanted to take it easy and just get in a good run around an 8:00 pace. Of course I made a friend during the race and went a little faster than I'd planned, but it was just so cool to know exactly where I was at any given moment. It has a ton of features that I haven't even explored yet too, such as its "Take me back to my starting point" feature for out and back runs which will be really helpful when running when traveling. 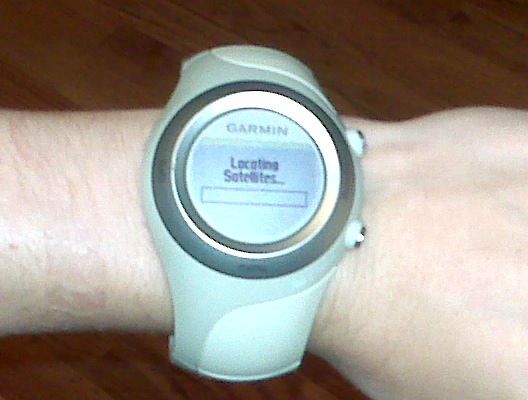 It lets me know each mile split as I finish each mile and can be set to let you know splits of any distance you choose. It has a feature called "Virtual Buddy" where you can set it up to race a little person on the screen, perhaps to help you pace yourself or for speedwork. You can even put in a course online and send it to the watch which will in turn direct you along that course while you're running. Wow. It's pretty spectacular. So if you are looking for the most amazing gift for someone who runs or bikes or hikes or is all around active, this is definitely going to blow them away. Garmin has a variety of styles of the Forerunner including some older models that use a little footpod attachment to your shoe to track you. The 405 has the footpod for use on a treadmill, ick. Here's a little taste of the info it gathered on a recent run with the Inwood Hill Running Club...or whatever we're called :) Riverdale Group Run Be sure to check out the "Player" on the right hand side, its really cool. I noticed a postcard sized advertisement today at the Hilltop Pharmacy tucked in among the stuff at the pharmacy counter and realized it was an advertisement for an art show going on right nearby! Hebrew Tabernacle: 551 Fort Washington Ave @ 185th St.
La Historia del Arte del Ascensor de Tren y Como Llego Ahi. 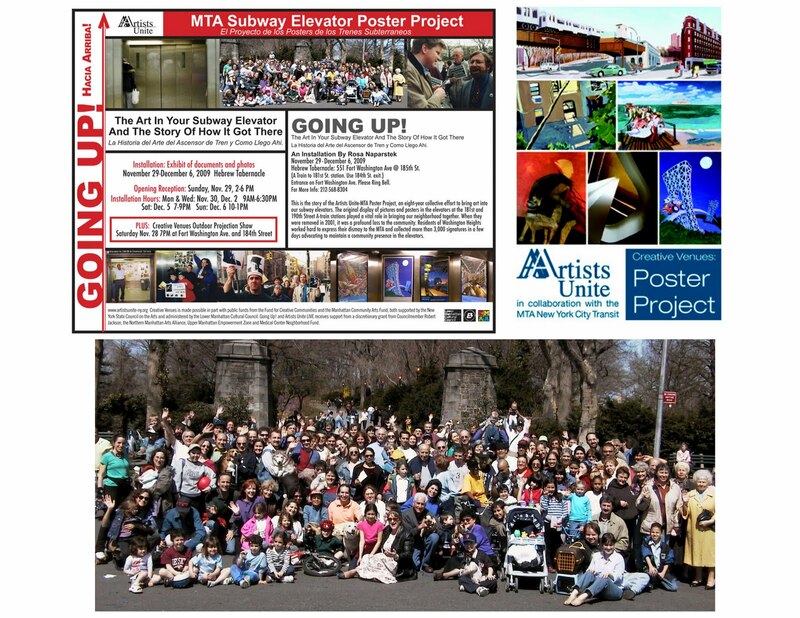 This is the story of the Artists Unite-MTA Poster Project, an eight year collective effort to bring art into our subway elevators. A-train stations played a vital role in bringing our neighborhood together. When they were removed in 2001, it was a profound loss to the community. community presence in the elevators. On the cover of this week’s issue of Newsweek is a photo that was shot exclusively for the August 2009 issue of Runner’s World, in which Sarah Palin was featured on the monthly “I’m a Runner” back page. The photos from that shoot are still under a one-year embargo, and Runner’s World did not provideNewsweek with its cover image. It was provided toNewsweek by the photographer’s stock agency, without Runner’s World’s knowledge or permission. Well I hope at least one person missed me while I was away. The wedding was amazing and the honeymoon was just awesome... things are still a little chaotic, but here's one picture from the underwater camera to hold you over until there's some more news from the hood! I hope everyone's enjoying this sweet, mild fall we're having. GREAT for running.